Management Issues: This waste, classified as Type 10C, includes anything which a patient may have touched (e.g. tongue depressors, examining table paper, cups, bibs, tubing, etc.) 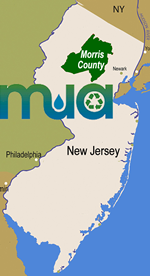 but is not Regulated Medical Waste (RMW) as defined in N.J.A.C. 7:26-3A.6(a). Since this waste is not RMW it can be collected by a normal solid waste collection company for transport to one of the Morris County Transfer Stations. This waste is disposed of at the transfer stations at slightly higher rates than non-medical solid waste but typically much less expensive than RMW. Because this non-RMW is more expensive than non-medical solid waste, it must be delivered to the transfer stations separately from non-medical solid waste. You must make arrangements with your solid waste collector to provide you with a dumpster for Non-RMW. Many health care organizations over-classify Non-RMW as RMW and end up paying much more to manage their waste than they have to.